What are the banks doing with our money? Where is your money? Probably not at the bank where you think you left it. The concept behind the film "Let’s Make Money" came from an advertising campaign for a bank: "Let your money work for you!" This is how the film traces the money, to where Spanish construction workers, African farmers, or Indian laborers multiply the money for western banks. "Let’s make money" shows us the celebrated fund managers who invest clients money every day, or entrepreneurs who, for the benefit of their shareholders, outsource production to foreign countries where labour and environmental regulations are more relaxed. This film briefly shows us several levels of the financial system and its consequences for our lives. Seeming inextricable transactions and impenetrable connections are traced back to simple principles and are summed up in concentrated conversations with convincing experts. Like his first, Erwin Wagenhofer’s second documentary does not disappoint. The film builds up suspense until the end. The protagonists are introduced objectively and comment on their own actions. Correlations are presented brilliantly. The absurdity of much of what is shown is astonishing and (up till now) unimaginable. It’s a mix of tragicomedy, clarification and artistic originality with respect to the interconnections between money and nature/the environment as well. The film is suitable for “intellectual evenings” with friends, but also for screenings in classes or special public events. 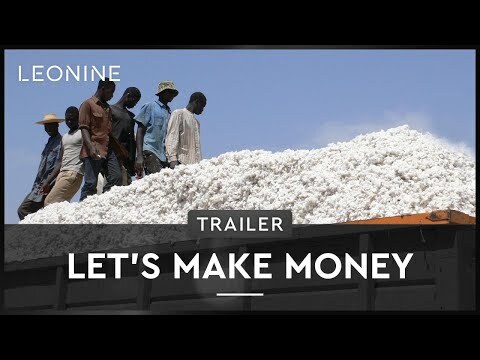 "Let's Make Money" leaves the audience in that typical state of mind after watching a good documentary: amazed, moved and shaken, having gained a broader perspective of how we are all interconnected and wondering what the future has in store for the human race and planet earth.